Sometimes the beauty and mystery of a biblical verse cannot be captured in translation. For example, scholars, saints, and doctors of the Church have been perplexed with how to translate the verse “Give us this day our daily bread.” The Greek word being translated as “daily” is epiousious. A word that appears only in this verse of the Gospel and nowhere else. Since the time of the early Church Fathers, agreement as to what the word epiousious means has not been reached. For me, the mystery of the word epiousious and the verse “Give us this day our daily bread” is expressed beautifully during the mass when the priest intones, after transforming ordinary bread and wine into the Body and Blood of Christ, “The mystery of faith.” These words cause me to pause. 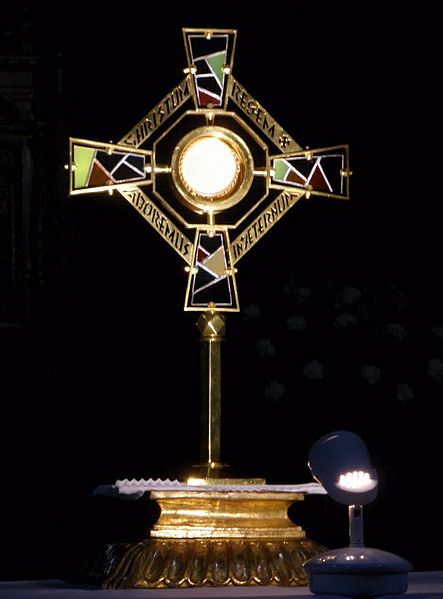 What a truly beautiful mystery is our faith, and the Bread of Life that sustains us. This entry was posted in Essays, Eucharist, Meditations On Biblical Verses, The Lord's Prayer, Uncategorized and tagged Bread of Life, Catholic, Catholicism, Christian., Christianity, epiousious, Eucharist, Give us this day our daily bread. Bookmark the permalink. Excellent post, Michael! I wish every Christian would read it. The definition of epiousion in Mt 6:11 and Lk 11:3 is rarely explained in sermons. Consequently, that verse of the Lord’s Prayer is not fully understood by the faithful. God bless! Saintly, Thank you for your kind comment. Very concise treatment of ἐπιούσιος.